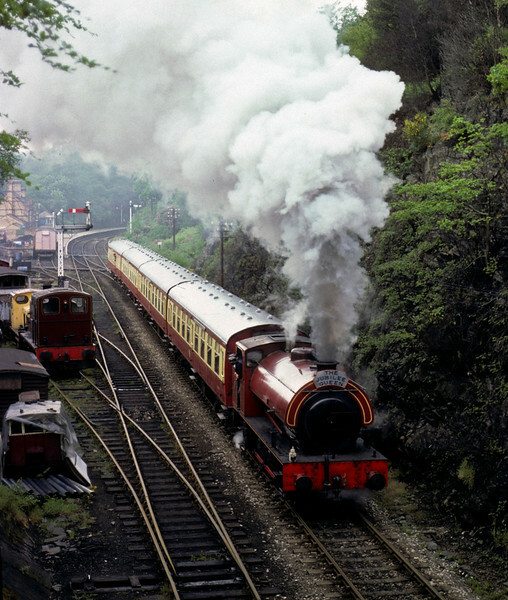 Cumbria, Haverthwaite, 11 June 1977 1. Former War Department Hunslet 0-6-0ST 3794 / 1953 was bought by the Furness Rly Trust in 1973. It is seen setting off with the first train of the day to Lakeside. The 'Jubilee Queen' headboard marked the Queen's Silver Jubilee. Photo by Les Tindall.